Creggs Rugby 37, Corrib RFC 22. 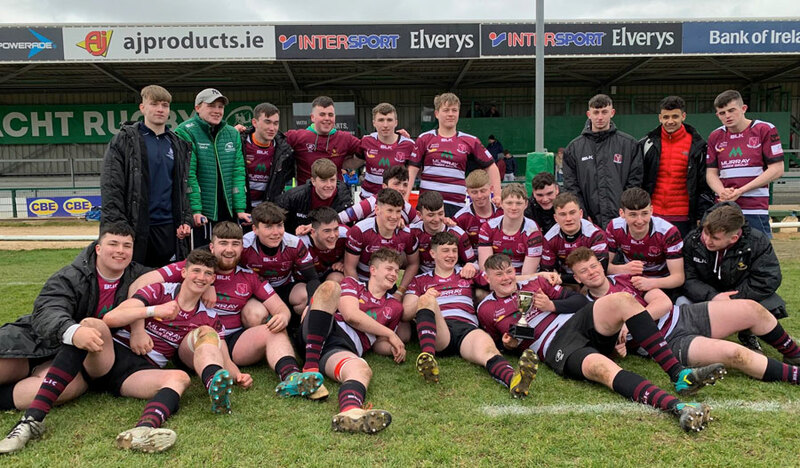 A wonderful end of season final played in difficult conditions saw Creggs under 18’s lift the silverware in the Sportsground on Sunday. After an end-to-end game, the Creggs lads finally pulled away from a dogged Corrib team in the last 8 minutes of a high scoring encounter. Just 24 hours after Connacht’s professional team secured a hard fought victory over Cardiff to secure a place in the PRO 14 plays offs and a place in next year’s Champions Cup Creggs young team ran out on the same hallowed turf to take on a very big and confident Corrib team with the Connacht League title at stake. 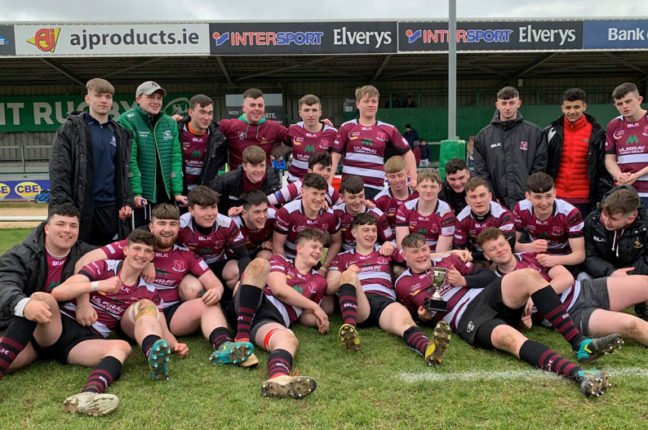 This was the teams fourth encounter of the season and Corrib RFC Under-18’s had won the previous two both by only one score margins. Creggs almost at full strength and buoyed by an excellent win over Ballina the previous weekend started well and had control of the early play. The conditions were far from ideal for the expansive game that the Creggs management had hoped for with gusting high winds and a chill factor of well below freezing this game was going to be won playing low risk rugby keeping handling errors down to the minimum. Playing with the wind in the first half Creggs needed to keep the scoreboard ticking over and opted for the posts when referee Shane McElwee penalised Corrib at the breakdown 30 meters out. Creggs out half Mark Purcell slotted over the kick for a 3-0 lead. Their good started continued when on eight minutes loose head prop Tom Farrell burst over from 5 meters out with Purcell on his shoulder following some strong forward pressure. The conversion was just wide of the left upright but the conditions were not in the kickers favour. Corrib with a definite weight advantage upfront were gaining momentum in the collisions and their excellent offloading game was getting them over the gain line only to be turned over on the floor by the dogged Creggs loose forwards where John Martin, Conor Rohan and John Mc Donnell were outstanding. Twenty five minutes in McElwee again penalised Corrib at the breakdown although easily within range but with the gusting winds making kicking a lottery Irish International scrum half Aodha Hession opted for the tap penalty and eight phases later that man again Tom Farrell powered over choosing to ignore the overlap with Ryan O Keefe outside him he just managed to ground the ball with two Corrib players unable to keep him out for a 13 -0 lead. Excellent reward for some great work at the breakdown form Jack Hanly and Roddie Mc Guinness and carries from the dynamic Thomas O’Brien. Corrib needed to get to halftime and still be in contention as there was no doubt that the strong gusting wind was going to be a big advantage to them after the break, however the task was made a lot harder when their centre Jack Walsh was yellow carded on the half hour mark for foul play. The strong Corrib character and defiance as their numerical disadvantage inspired them to find another gear and the team of 14 were causing all sorts of problems for the Creggs defence. The excellent Corrib number 10 and captain Nigel Egan was the stand-out player on the pitch and he and Corrib were justly rewarded as half time approached with a try from a well-planned pick up off a scrum by number 8 Evan Mchugh and Egan cutting back at speed sliced through to score and go in at half time 13-5 down. Creggs knew they had the tactical game to play against the wind in the second half but would have like to turnaround with a bigger lead, Corrib now back to their full complement had other ideas and were awarded a penalty for a high tackle. Using the swirling wind to his advantage Nigel Egan calmly slotted over to reduce the deficit to just 5 points and we had all the making of another titanic battle between these two sides. Fifteen minutes into the second half Corrib RFC took the lead for the first time when it was again Egan who was the man to touch down for the try only this time his conversion slid just wide. Creggs had the advantage of strong substitutes introducing Jack Keegan and Cian Glennon and the fresh legs told almost immediately. Strong yards gained up the middle of the pitch by Lorcan Maher and Jonathan Whyte followed by very slick passing and full back Tim Lambe entered the line to score in the corner to restore the lead for the maroon and white of Creggs. Also for Creggs Eoin Mc Donnell and Ethan Glennon were added to relive some tiring legs and hopefully influence a game that could be slipping away. The young Creggs players Tucker and Maher were outstanding gaining vital hard yards protecting the ball like a Faberge egg. The drama was far from over and when Creggs from a defensive lineout had a kick charged down and the speed of turnover saw Corrib lock forward Michael Loughlin over the whitewash for a converted try and Corrib back in the lead 18-22 with only eight minutes remaining. Showing great composure in the final minutes of the match Creggs exploded with three magnificent tries stunning their opposition and supporters alike. First Aodha hession showed his knowledge of the laws touching the ball at base of the post to restore the lead with a converted try. The kick off was returned with interest by Ethan Glennon, and Mark Purcell broke, kicked ahead and John Martin touched down for the score of the match in injury time. Then in almost an action reply from the restart again Glennon returned with extra interest and Purcell outstripped a number of exhausted Corrib players leaving them in his wake to touch down at the posts. Tim Lambe lifted the cup for the village team and a victory margin of 37-22. Well done to this very good squad of players, their coaches and the Ceggs supporters. This team has one more game to play later this month, another Connacht Final – more details next week. Creggs Rugby: 1 Tom Farrell, 2 Roddie McGuinness, 3 Jack Tucker, 4 Thomas O’Brien, 5 Jack Hanley, 6 John Mc Donnell, 7 John Martin, 8 Conor Rohan, 9 Aodha Hession, 10 Mark Purcell, 11 Martin Quinn, 12 Lorcan Maher, 13 Jonathan Whyte, 14 Ryan O Keeffe, 15 Tim Lambe, plus the extended Squad: Micheal Beirne, Ronan Lambe, Amaury Duarte, Ethan Glennon, Eoin Mc Donnell, Cian Glennon, Tiernan O Sullivan, Ben Finnerty, Jack Hanley, Kaylem Hollian, Jack Keegan, Erin Coyne, Conor Murphy, and Ciaran Corcoran.